FILE - Republican presidential candidate Donald Trump smiles as he speaks at a campaign stop Tuesday, March 29, 2016. If the past is an accurate predictor, President Park Geun-hye’s conservative ruling Saenuri Party should benefit in the upcoming South Korean legislative elections from both North Korea’s most recent nuclear provocation and from U.S. presidential candidate Donald Trump’s criticism of the U.S., South Korean military alliance. “When tensions are heightened due to North Korea, conservatives usually gain votes,” said political analyst Hwang Tae-soon with Wisdom Center think-tank in Seoul. All 300 seats in the South Korean National Assembly will be selected during the April 13 election, with voters directly choosing 253 district representatives and 47 seats being proportionally awarded to parties that win the most overall votes. Conservatives have been in power in South Korea since 2007 and President Park was elected to her single five-year presidential term in 2013. The opposition is framing the vote as a referendum on Park’s policies, and its outcome will determine the degree to which she will be able to pursue her legislative agenda for the remainder of her term. The Saenuri Party’s approval rating went up following North Korea’s fourth nuclear test conducted in January, its recent long-range rocket launch using ballistic missile technology and threats to launch a preemptive nuclear strike against the South. Polls indicated a spike in public support for Park’s strong stance in favor of punitive economic sanctions and for closing down the jointly run Kaesong industrial complex. Prior to the 2013 election a North Korean long-range rocket launch increased voter concern over national security issues and helped increase the margin of victory for Park and the Saenuri Party. Criticism of the U.S., South Korea security alliance from Donald Trump, the front running U.S. Presidential candidate for the Republican Party, may also impact the race in favor of conservative candidates. Trump has said he would consider withdrawing many of the more than 150,000 American troops stationed in South Korea, Japan, Germany, and around the world if the U.S. does not get fairly compensated for helping defend those countries. 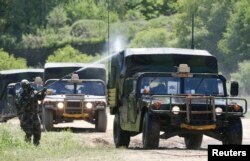 FILE - A U.S. soldier is seen during decontamination exercises in Yeoncheon, about 65 km north of Seoul, May 16, 2013. He recently implied that the U.S. would not defend Japan if North Korea launched a nuclear attack against it, and indicated he would support America’s Asian allies in acquiring their own nuclear weapons to defend against a nuclear North Korea. While Trump is speaking only as a candidate and not as president, his comments cast doubt on the U.S. commitment to its security alliance with South Korea. “This situation may lead to a collection of more votes for conservatives as they claim South Korea needs to have a more firm and strong position against North Korea,” said Hwang. However national security concerns may only have a marginal impact on this election as the social liberal opposition has tried to downplay its past support for engagement with the North and has instead focused on the economy. Saenuri’s opponents want to make the election about jobs. Saenuri has backed a corporate friendly economic agenda, expanding free trade agreements, tax breaks for businesses and concessions from labor. These policies, critics say, have resulted in stagnant wages for many, jobs moving to lower wage countries and a drop in exports, due in large part to the economic slowdown in China. Last year tens of thousands of labor supporters participated in mass protests to oppose a labor reform bill backed by Park to make it easier for employers to fire workers. At one rally in November, protesters fought police with steel pipes and police used water cannons and barricades to stop the crowd. Some of the leaders were arrested for organizing illegal demonstrations and human rights groups criticized Park for suppressing freedom of speech. 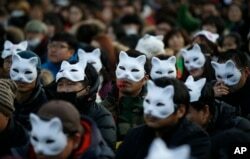 FILE - South Korean protesters wearing half masks attend an anti-government rally in downtown Seoul, South Korea, Dec. 19, 2015. Saenuri currently holds 146 seats in the National Assembly. The leadership had earlier predicted increasing its margin to 180 seats, giving it a 60 percent majority and the power to override any opposition attempts to block legislation. However the party is now defining victory as winning a straight majority of 150 seats, after a number of Saenuri candidates defected from the party when the leadership did not back them during the nomination process and are now running as independents. “During the candidate selection process, we upset our people and (the number of) our supporters who may not vote is worse [than we expected],” said An Hyung-hwan, the spokesman of the Saenuri Party on Monday. The main opposition Minjoo Party of Korea is also divided. Minjoo is looking to boost its 102 seat margin to 130 seats. But an additional group of 20 legislators who were part of the Minjoo delegation, have split off to form the separate People's Party. There is concern that in hotly contested districts, the two opposition candidates will split the liberal vote and assure the conservative Saenuri candidates a higher percentage of the fragmented field. Still, nothing is for certain as over 80 races at this point are still considered too close to call.